Ali is thrilled to return to the Last Frontier Theatre Conference for the third time, where her play IN EVERY GENERATION will receive its first public staged reading. IN EVERY GENERATION is a mystical journey through continents, languages and generations of a family and nation’s stories. An Italian Jewish family joins together for Passover Seders year after year, era to era. Over matzah ball soup and (vegan) brisket, sibling rivalries simmer, plagues fall, and miracles are both remembered and forgotten. IN EVERY GENERATION asks what happens to a people once they are no longer in danger? How does a community collectively adjust to freedom? 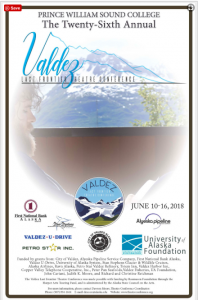 Ali just returned home from another incredible week at the 24th annual Last Frontier Theatre Conference in Valdez, Alaska. Her play Deadheads was accepted into the 2016 Play Lab and performed as a staged reading on Monday, June 13. Her mentors included playwrights Arthur M. Jolly, Arlene Hutton, and Cassandra Medley. She is very grateful to Dawson Moore and the Conference for another truly unforgettable experience and opportunity to workshop her play. Ali just returned home from an incredible week at the 23rd annual Last Frontier Theatre Conference in Valdez, Alaska. Her play Quick, Change was accepted into the 2015 Play Lab and performed as a staged reading on Tuesday, June 16. Her mentors included playwright Eric Coble, actor Elizabeth Ware, and designer Colleen Alexis Metger. She is very grateful to Dawson Moore and the Conference for the truly unforgettable experience and opportunity to workshop her play.